1. 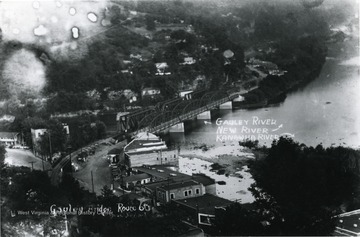 Route 60,Gauley Bridge at Confluence of Gauley, New and Kanawha Rivers in Fayette County, W. Va.
Route 60,Gauley Bridge at Confluence of Gauley, New and Kanawha Rivers in Fayette County, W. Va.
2. 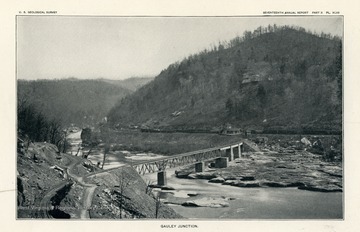 Gauley Bridge, Fayette County, W. Va.
Gauley Bridge, Fayette County, W. Va.
Gauley Bridge where the Gauley and New River form the Kanawha. 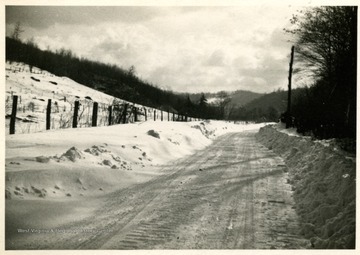 A snow covered Gauley River Road to Bergoo Mine #6 in Webster County. 8. 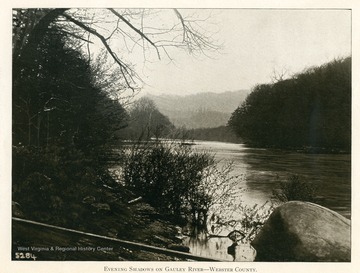 Ferry at Junction of Cherry and Gauley Rivers, Nicholas County, W. Va. 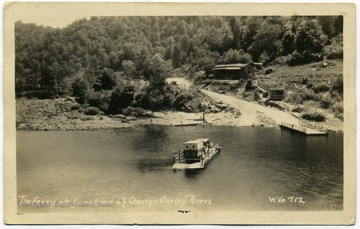 Ferry at Junction of Cherry and Gauley Rivers, Nicholas County, W. Va.
9. 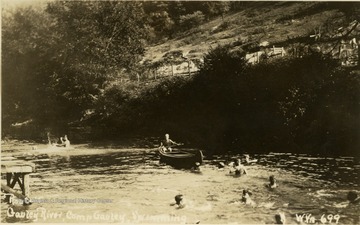 Gauley River, Camp Gauley, Swimming, Webster County, W. Va.
Gauley River, Camp Gauley, Swimming, Webster County, W. Va.
Postcard photograph of of several swimmers and one boy paddling a canoe. All persons in the photograph are not identified. 10. 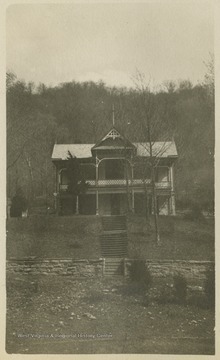 Front View of "Holly Hall" on Gauley River, W. Va.
Front View of "Holly Hall" on Gauley River, W. Va.
""Holly Hall" from the front. The stake shown in the foreground, at the bottom of the picture is Sta. 161 of our Location. 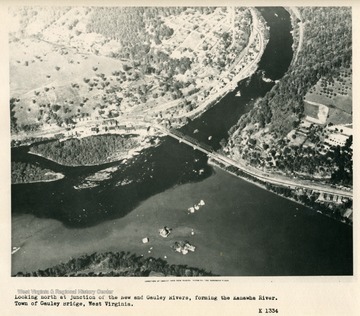 "This photograph is found in a scrapbook documenting the survey for the Baltimore and Ohio Railroad in West Virginia and surrounding states. 11. 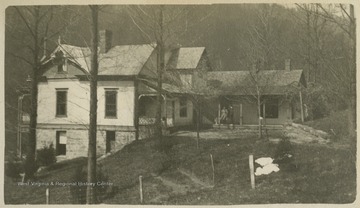 Rear View of "Holly Hall" on Gauley River, W. Va.
Rear View of "Holly Hall" on Gauley River, W. Va.
"The best view of "Holly Hall," showing the back pourch [sic] where we all congregate in the evenings after supper to smoke, sing, and talk. 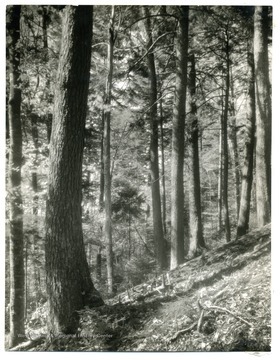 "This photograph is found in a scrapbook documenting the survey for the Baltimore and Ohio Railroad in West Virginia and surrounding states. 12. B. &amp; O. Railroad Surveyors at Start of Journey to Camp "High Life" on Gauley River, W. Va.
B. &amp; O. 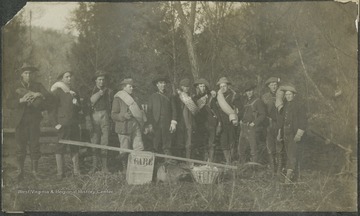 Railroad Surveyors at Start of Journey to Camp "High Life" on Gauley River, W. Va.
A group of men pose with supplies before their journey to Camp "High Life," where they slept in the open for several nights.This photograph is found in a scrapbook documenting the survey for the B. & O. Railroad in West Virginia and surrounding states.